Support Portal Home » Hosting Guide » Let's Get Started » DNS & Name servers » What Are My Name Servers? The term "name server" refers specifically to a server that hosts DNS zone files. When an end user visits a domain, the DNS lookup first checks the name servers provided by the domain, which indicate which server to check for the specific DNS records for that domain. All HostGator servers host DNS zones and may act as name servers, and you may use our name servers to host your DNS settings. Note: Many registrars and web hosts will use the term "nameservers" interchangeably with "name servers". It is a common and generally accepted alternate spelling. Where Can I Find My HostGator Name Servers? If you are not sure of what the HostGator name servers are supposed to be for your website's domain name, you can find the information needed inside of your HostGator welcome email. 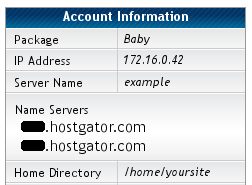 Shared hosting customers can also find their HostGator name servers listed inside of their cPanel. Despite the type of account you have with HostGator, the welcome email which was sent when you signed up for web hosting will contain the name servers listed for your hosting account. These name servers can be used on all sites that are hosted on your HostGator webhosting account. If you have lost your welcome email, it can be requested again by contacting us via phone or Live Chat. For Shared hosting plans such as the Hatchling, Baby or Business plan, you can also look up your name servers in your cPanel. If you are using the default HostGator (HG) theme, then your name servers will be listed in the Account Information panel at the bottom of the left-hand column (see example image). If you are not using the default theme in cPanel, you would need to temporarily switch to the HG theme to see the name servers. Please see our article on style change in cPanel if you need to change to the HG style. You can always revert to the style you like once you find your name servers. Should I Use Generic or Private Name Servers? If you are a reseller, then you can opt to use private name servers instead of the generic name servers we provide. If you are a VPS or Dedicated Server owner, you must use private name servers. The generic name servers for resellers do not contain the word "hostgator." You can look up the actual generic reseller name servers for your account using the methods above or by contacting HostGator support. Note: For optimal performance, your server has its own set of name servers. Because of this, it is important to use the name servers provided specifically for your server. Using other name servers on our network won't work since the information about your website is on the name servers provided.